Book Review Template is an excellent tool from ReadWriteThink that allows students to easily create and share book reviews. As a teacher you may want to use this template to encourage students to communicate their thoughts and ideas about books they read. It is also an effective way to enhance students overall comprehension of a given text. 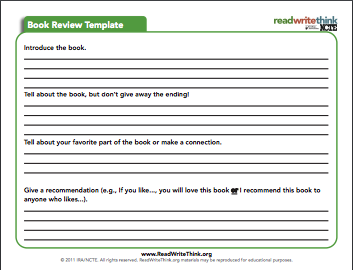 For more ideas and tips on how to incorporate Book Review Template in your instruction check out this page. Book Review Template consists of four main parts: in the introductory part students are asked to provide a short introductory passage about the book. In the second part, students will have to talk about the book but without revealing its ending. The third part is where they will discuss their favourite part of the book and probably make connections to other readings. In the last part students will express their opinions about the book and give recommendations to future readers.